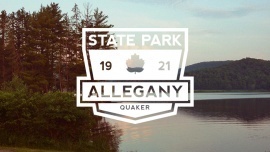 I've been going to Allegany State Park for as long as I can remember. Some of my most cherished memories were forged here. Even before I was a thought my parents have been coming here with their friends and I plan on holding to that tradition and continuing to pass it down. Great stories have been told and grand adventures have been had. Allegany State Park has a great hold on my heart and I feel it deserves a ton of love back. I've started with a mind map to spit ball some words and imagery that stick with me about the park and what I feel and I want others to get out of this awesome place. Following the mind map and giving myself some time to think and not think about where I want this brand to go I've come up with a few initial rough sketches for critiquing and further development. Enjoy. 12.11.12 First go at vectorizing my ideas/playing around with color. I wanted to keep the color palettes simple/natural with a little pop to them. Also started playing with different type and things of the like. Would love to get everyone's thoughts as I push this project/logo further. Thanks! After much tweaking/playing around with the original polished forms I came up with and combining & removing elements from the three I ended up with this as my final. I'm quite pleased with it. I feel it captures the rustic nature of camping and is somewhat of a lasting mark which can be used for different scenarios. Quaker & Red House are the two sides of the park and so I gave each of them their own mark.